When it comes to tacos, Indiana is serving up some authentic options bursting with zesty, spicy, and savory flavors. Taco joints across the state offer everything from the pork variety to something more unique like delicious fish tacos. Your stomach will thank you after every mouthwatering bite at these 10 best taco places in Indiana! Another great place to find delicious and authentic Mexican food in Lafayette is Lindo Mexico. Family owned and operated since 1996, Lindo Mexico is all about hard work, family, and serving quality food that keeps you coming back for more. The atmosphere at Lindo Mexico represents Mexican Culture with the beautiful carvings brought from Guadalajara Jalisco, the home of the Bravo family. The beef and chicken soft tacos are to die for, as is their Tacos de Asada. Yum! For true, authentic Mexican food, you must check out Taco Rico in Lafayette. Family owned and operated, the food is what authentic Mexican food should be. Delicious. Spicy. Mouthwatering and flavorful. The service is outstanding and the prices are affordable. If you ever find yourself with a craving for tacos, Taco Rico is the place to be. Try a taco salad too! It’s so delicious! If you are wondering where the best place in Kokomo is to find tacos, look no further than Gordo’s Taco Shop. Family owned and operated for over 20 years, Gordo’s prides itself on doing food the way it should be done: authentic, delicious, and oh so yummy! The food is made fresh and you won’t find ground beef as an ingredient. Not to mention the salsa is homemade with fresh tomatoes. The favorite on the menu? Tacos! Gordo’s has some of the best tacos in Kokomo, so if you ever find yourself passing through, be sure to stop! Should you ever happen to find yourselves passing through Noblesville, you have to stop and check out Samano’s Mexican Food. From the moment you walk in the door, it feels as though you’ve crossed into Mexico City, which is what head chef and owner Adrian Samano planned when Samano’s opened. Everything is authentic, from the food to the atmosphere. The food is made with fresh ingredients upon every order, and Samano’s also has one of the best, homemade salsa bars in Indiana. Their tacos are delicious, made with fresh corn tortillas, onion, cilantro and any meat of your choice, from chicken, steak, pork, or Mexican sausage. Considered to have the best tacos in town is Tacos Arandas “El Amish,” located in Fort Wayne, Indiana. Located on Broadway street, the building is bright from the inside out and one you do not (and cannot) miss as you pass through Fort Wayne. With an authentic flair and delicious food, owner Jose ‘El Amish’ Romo prides himself on serving the best of the best. The tacos are incredible, filled to the top with meat and other delicious toppings. Try a chorizo (Mexican sausage) taco or the Buche (fried pork) taco! 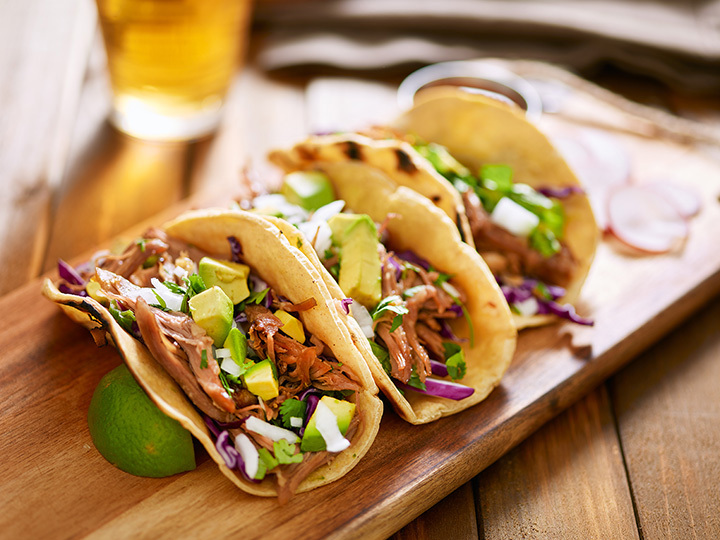 Michigan City is full of great places to eat, but the best place to find true, authentic tacos is El Cajete Mexican Kitchen. Family owned and operated, El Cajete has been in Michigan City since 2012. The recipes are authentic, the food delicious, and the service outstanding. The Al Pastor tacos are scrumptious and the Pescado tacos are rich and flavorful. The small town of Warsaw, Indiana, has much more to offer than one would assume, especially when it comes to having delectable Mexican food. Mi Lindo Acapulco opened in 2003, with owner Socorro Brito finally realizing her dream to open her own restaurant. That’s right, ladies. Mi Lindo Acapulco is owned and operated by a fabulous woman with a warm smile every time you come in the door and dedication to her business and her customers. The servings are impressive and you will never leave the restaurant feeling hungry. Try the Alambre taco today! Rosita’s Mexican Restaurant in Indianapolis has some of the best tacos in Indiana. Quirky and filled with character and authenticity, Rosita’s is the place to be for great tacos. The restaurant is colorful and inviting, with warm colors to make you feel at home. They are well known for their Taco Tuesdays, and even more well known for their outstanding customer service. The Flautas Taco is delicious, as are the Taco Supremes. Located in the small town of Union City is Taqueria “Luz Tacos.” With its quirky exterior, many may not think that Taqueria “Luz Tacos” could possibly have the best tacos in Union City, but they do. Serving up fresh, authentic, home style Mexican food is what Taqueria’s does best. The restaurant is family owned and operated, making simple but fantastic Mexican food to fill your stomachs at a reasonable price! Tacos My Fren is indeed your friend when it comes to serving some of the tastiest tacos in La Porte, Indiana! In business for the last five years, Tacos My Fren is new to the La Porte area but have already become a favorite of the locals and those passing through. The service is excellent and the food even better. Everything is fresh and delicious and will leave you coming back for more!